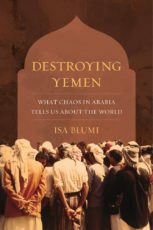 Professor Isa Blumi argues that the war in Yemen today has been mischaracterized as a civil war, and instead, he says is a war over the empire and international finance, with a deep colonial history that stretches back to the Ottoman empire, the British empire and currently the American empire. Isa Blumi is Associate Professor in the Department of Asian, Middle Eastern, and Turkish Studies at Stockholm University. He is the author of Ottoman Refugees, 1878-1939; Foundations of Modernity; Reinstating the Ottomans; and his latest Destroying Yemen: What Chaos in Arabia Tells Us about the World.